We always talking about the video formats, like MOV, MP4, AVI,etc., they all sound very familiar. However, when we switch to the audio side, what audio formats will come to your mind first? WAV is no doubt one of them. WAV stands for Waveform Audio File Format, is a Microsoft and IBM audio file format standard for storing an audio bitstream on PCs. The excellent, various and interesting sound effect is the key issue that really makes WAV stands out, regardless of other audio formats on the market. No matter you are a film director, game player, music singer, website builder, as long as you are looking for some ready-to-use and interesting sound effect in different forms(sound clips, noise) & in different genres ( for example Ambience, Sports, Events, Airport, Radio, Industrial, Ringtone, Multimedia, Cartoon etc. ) or generated by different instruments like drums, turntable, bass, guitar, percussion loops, vocals, synth loops, strings or keyboard…in your film, game, music or TV shows, a huge sound effect data base exactly in WAV file format is completely ready for instant listening, testing, licensing and downloading. It’s absolutely amazing to have such a WAV sound effect library out there for public use. WAV is usually compared with MP3 since both of them are the popular and well-known audio formats. People are always asking: which one is better and which one has better audio quality? 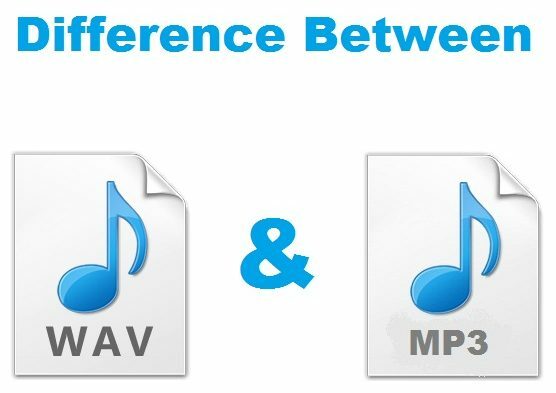 We’ll answer this by firstly pointing out the biggest difference between WAV and MP3: WAV is uncompressed, lossless, with CD quality and perfect choice for web animators to process with Flash, while on another hand, MP3 is a music file format that is compressed, encoded, smaller in size and kind of lossy. Therefore, if the sound quality is the core factor you are looking for, WAV is better and that’s why WAV enjoys widespread use especially by broadcasters for a long time. - Audio bitstream storage on PCs only — this brings out the request to convert WAV to other audio formats or to even other video formats like DVD. If your target is to convert WAV to other audio formats like MP3, OGG, WMA, M4A, AAC, etc. Or to convert from any one to another one among these audio formats, check these two free online audio converter. 1. Media.io — free, powerful, easy and handy online audio converter that can help you convert almost any audio formats in just 4 steps. Input audio formats support up to 35+ popular formats including WAV, TTA, MP3, M4A, AAC, MP2, VOC, ASF, MOD, SPX, etc., output audio formats support MP3, WAV, WMA and OGG. 2. Audio Converter — free and online audio converting tool as well. It supports to import the popular audio formats including WAV and outputs audio formats like MP3, WAV, iPhone ringtonne, M4A, FLAC, OGG, MP2 and AMR. Advanced settings are also available to adjust the specific audio parameters. if your goal is to burn WAV audio to DVD directly, a professional audio DVD maker is needed in this case. An audio DVD maker can do much more than just a simple audio converter. 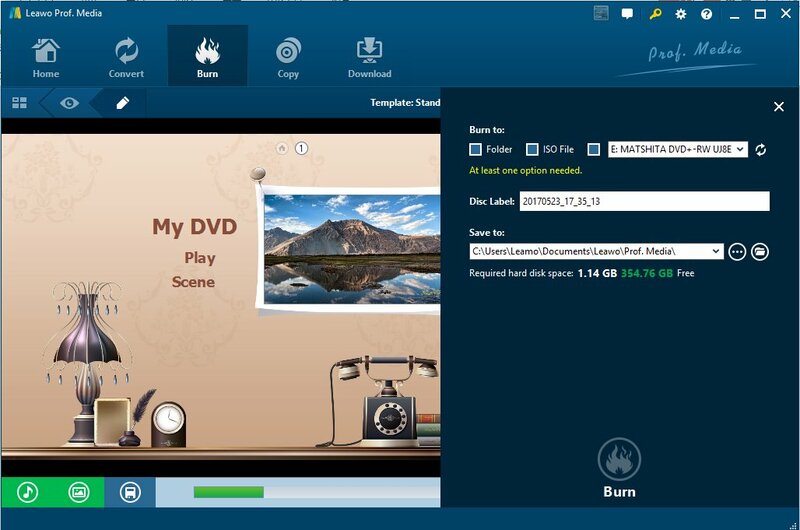 It can burn your WAV file to real hard-copy DVD with even customized DVD menu templates, advanced audio settings and 3D effect(for video conversion only). 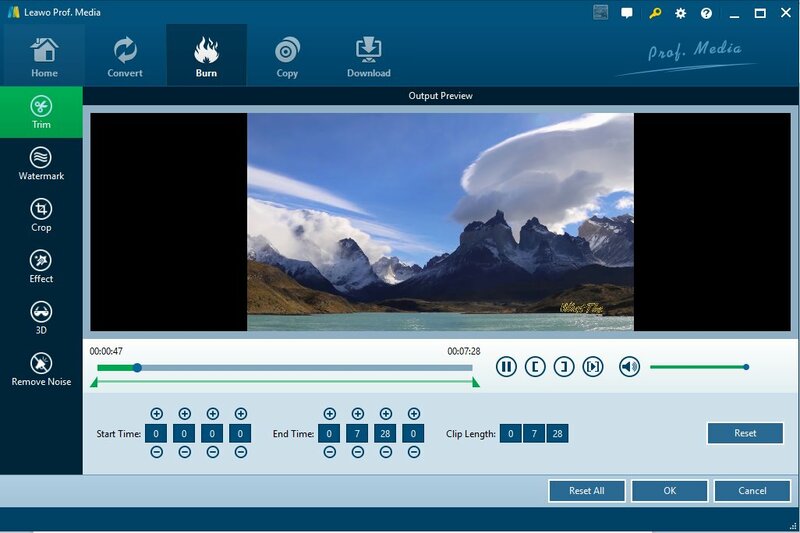 Leawo DVD Creator can be used as such a WAV audio DVD burner to turn your 180+ audio(WAV included)/video/photo formats to DVD with 6X faster speed and 40+ beautiful DVD menu templates. The detailed steps below will demonstrate how to achieve this WAV to DVD conversion. 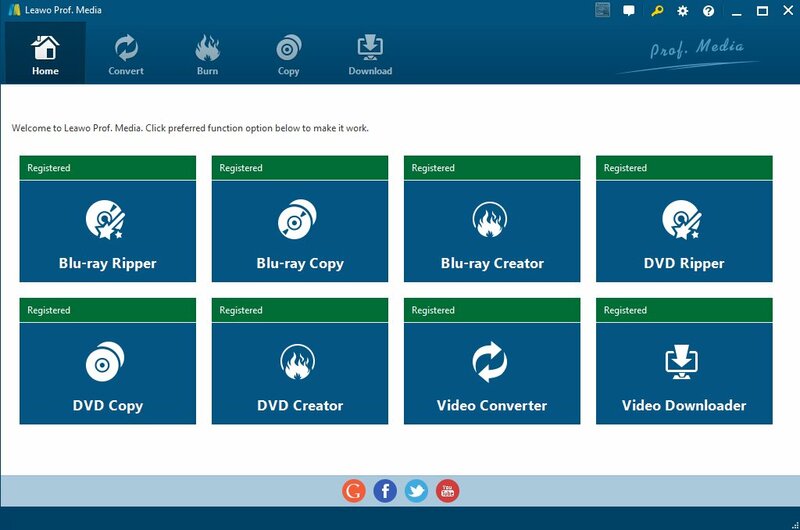 Step 1: Launch Leawo DVD Creator(included in Leawo Prof. Media) and click DVD Creator tab. Step 2: This step is very important, due to the fact that not all the main-stream DVD creators on the market support to import audio file directly, users have to convert WAV first to any other popular video format using the Video Converter module also included in Leawo Prof. Media or you can choose others from different brands. Here we take WAV to MP4 for example. After the WAV to MP4 conversion, click Add Video to import the converted MP4 file from your computer folder. Or you can drag and drop the MP4 file directly. Step 3: After source video file loading completed, you can play the video for preview, set the output DVD disc type (DVD-5 or DVD-9), Fit to disc, aspect ratio (16:9 or 4:3) at the bottom and do the video profile advanced settings. 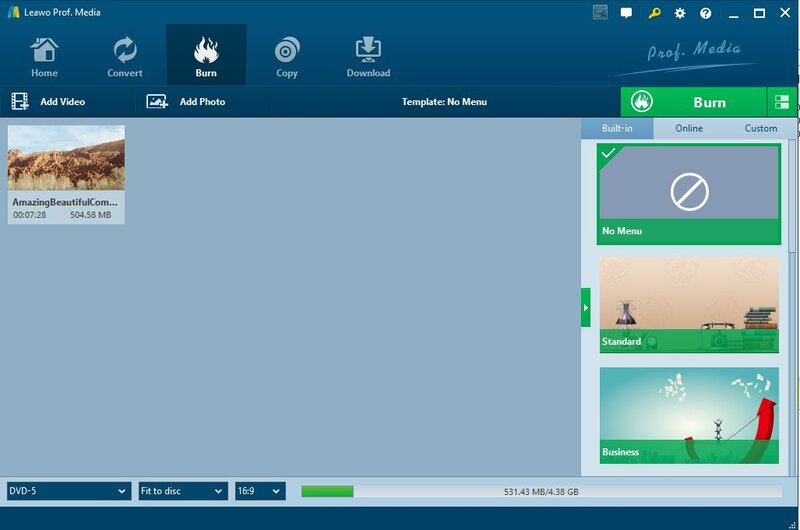 Step 4: You can leave the disc menu blank or you can choose a proper template either from the built-in template data base, or from internet or you can even customize one. After the template has been selected, you can preview and edit it according to your needs. Step 5: Click the green Burn button to set the Burn to path, Disc Label and start the burning process officially. Except the direct import of WAV audio file, Leawo indeed did a great job: customers liked the user-friendly interface and the disc menu template DIY feature. The Leawo team however has been said already working on the direct WAV import function to ensure a more convenient WAV to DVD burning experience. For your reference, there are already some similar audio DVD makers on the market with the direct WAV import function, for example Apollo Audio DVD Creator. Try Leawo first and search for more if you like.